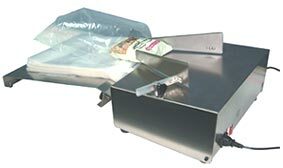 Smooth & silent fan motor makes for rapid packaging and filling. Stainless steel body for safety and cleanliness. Easy to change wicket bags. Constant airflow opens bags smoothly one after the other. Dimension(W.xL.xH.) 16" x 27" x 6"